Hang on: what was wrong with your old phone? Well-remembered! You’re right, of course, that last year I got a Nokia N900, and that it was the best mobile communications device I’d ever owned. I don’t care so much about a slim profile or an “app store”, but I do care about raw power and geeky hardware features, and the N900 delivers both of those in spades. I’ve had several phones that have, at the time, been the “best phone I’ve ever owned” – my 7110 and my N96 both also earned that distinction, whereas my 7610 and my C550 – the latter of which had only one redeeming feature – fell far short. 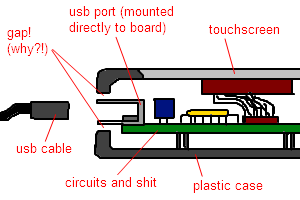 A cross-section of a Nokia N900, showing how the USB port is mounted directly to the circuit board, and doesn't touch the hard plastic case. A cross-section of a Nokia N900, showing the USB port snapped off by the USB cable. Looks like I spoke too soon, because that very week, I managed to break my N900 in exactly this way. My theory: that girl is cursed. I shall be attempting to exorcise the anti-technology demons in her the very next time I see her, possibly in some kind of ceremony involving high-voltage direct current. In any case, I found myself with a phone that I couldn’t charge. No, of course not. 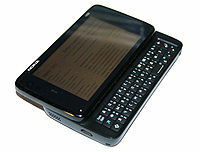 My N900 remains a fantastic palmtop and a great device. It’s just got a minor problem in that it’s no longer possible to charge or “hard”-tether it to anything any more. The latter problem was an easy one to fix: a separate battery charger (I already carry a spare battery for it, so this was no hardship), bought for about £4 on eBay, made it easy to keep the device rolling. The second problem’s not so much of an issue, because I tend to do all of my synchronisation by Bluetooth and WiFi anyway. 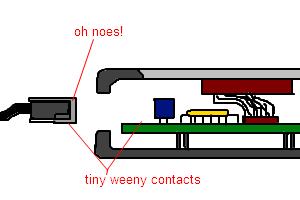 But even if these were an issue, it looks like a pretty simple job to re-solder the USB port (and epoxy it to the case, as it should have been to begin with!). I might give it a go, some day, but my current soldering iron is a little big and chunky for such fine and delicate work, and I’m a little out of practice, so I’ll save that project for another day. However, I’m a big believer in the idea that when the Universe wants you to have a new phone, it finds a fault with your current phone. Perhaps this is the geek equivalent of thinking that “When God closes a door, He opens a window”. 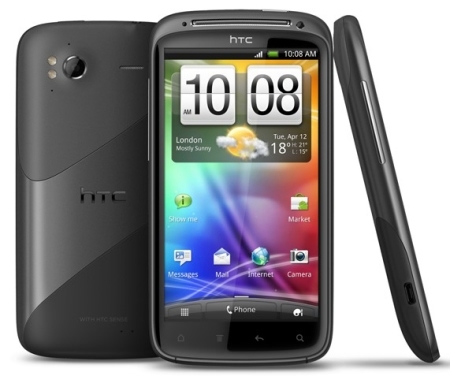 So: I’ve got myself a HTC Sensation, which narrowly beat the Sony Ericsson Xperia Arc after carefully weighing up the reviews. I’d always planned that I’d try an Android device next, but I’d originally not expected to do so until Ice Cream Sandwich, later this year. But… when the Universe closes your USB Port, it opens a Gingerbread shop… right? After a few difficulties relating to my name – it turns out that my mobile phone network has recorded my name correctly in their database, and I can’t change it, but whenever I use their web-based checkout it asks me to enter a longer surname even though I don’t have a surname field to change – I finally received my new phone. HTC Sensation seen from the back, front, and side. The first thing one notices about this phone is that it’s fast. Blindingly fast. I’ve used a variety of Android-powered HTC devices before, as well as other modern touchscreen smartphones like the iPhone, and I’m yet to use anything that consistently ramps up high-end graphics and remains slick and responsive like this does. Its mighty dual-core 1.2GHz processor’s the cause of this, little doubt. I originally worried that battery life might be limited as a result – I don’t mind charging my phone every night, but I don’t want to have to charge it during the day too! – but it’s actually been really good. Using WiFi, GPRS, GPS, playing videos, surfing the web, and other “everyday” tasks don’t put a dent in the battery: I’ve only once seen it dip to under 10% battery remaining, and that was after 40 hours of typical use during a recent camping weekend (with no access to electricity). It’s also been really well-designed from a usability perspective, too. Those familiar with Android would probably just start using it, but I’ve not had so much exposure to the platform and was able to come to it with completely fresh eyes. Between Android 2.3 and HTC Sense 3, there’s a nice suite of “obvious” apps, and I didn’t have any difficulty synchronising my contacts, hooking up my various email accounts, and so on. There are some really nice “smart” touches, like that the phone rings loudly if it thinks it’s in a bag or pocket, more quietly after you pick it up, and silences the ringer completely if you pick it up from a table and flip it from face-up to face-down. These simple gestural touches are a really nice bit of user interface design, and I appreciate the thought that’s gone into them. 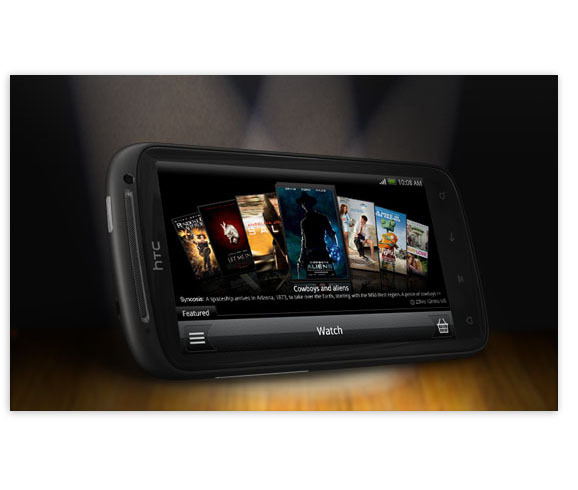 Browsing movies for HD streaming on the HTC Sensation. The Android Marketplace is reasonable, although I feel as though I’ve been spoiled. On the N900, if there was an application I needed, I usually already knew what it was and where I’d find it: then I’d either apt-get it, or download the source and compile it, right there on the device. For somebody who’s already perfectly confident at a *nix command-line, the N900 is fab, and it feels a little restrictive to have to find equivalent apps in a closed-source environment. It’s not that the pricing is unreasonable – most of the applications I’ve wanted have been under a quid, and all have been under £4 – it’s just that I know that there are FOSS alternatives that would have been easy to compile on my old device: I guess it’s just a transition. On the other hand, the sheer volume of applications so-easily available as the Android Market is staggering. I’ve been filled with app ideas, but every idea I’ve had but one or two already exist and are just waiting to be installed. It’s a little like being a kid in a candy store. It’s also taking me quite some time to get used to the way that process management works on an Android device. On Android devices, like the iPhone/iPad, returning to the home screen doesn’t (necessarily) close the application, but it might – that’s up to the developer. If it doesn’t, the application will probably be “paused” (unless it’s a media player or it’s downloading or something, then it’ll likely keep going in the background). And when you re-launch the same application, it could be simply unpausing, or perhaps it’s relaunching (in which case it may or may not restore its previous state, depending on the whim of the developer)… You see all of the keywords there: might, probably, likely, could, perhaps. Great for most users, who don’t want to have to think about what their phone is doing in the background, but it feels like a step backwards to me: I’m used to being able to ALT-TAB between my currently-running applications, to know what’s running, when (and I can always use top and find out exactly what resources a process is eating). Putting all of this process management into the hands of developers feels to me like giving up control of my device, and it’s a challenging change to undergo. Yes: despite the openness of the platform, Android feels just a little out of my control compared to what I’m used to. Hacker's Keyboard, my preferred keyboard layout for SSH, etc. Switching from a physical to a virtual keyboard for the first time is a significant change, too, and it’s slowed me down quite a lot, although applications like SwiftKey X – with its incredibly intelligent personalised predictions – and Hacker’s Keyboard – which gives me back some of the keys I was “missing” – have helped to ease the transition a lot. In summary: the HTC Sensation seems to be a fantastic device, and I’m really enjoying using it. I’ve got a few niggles to contend with, but these are all things that were destined to catch me out upon switching away from a platform as open as the N900, and they’re not severe enough to make me give up and get an N950 instead: I’m reasonably confident that I’ll come to love the Sensation and we’ll go on to be very happy together. But will it become my latest “best phone ever”? Time will tell, I guess. Have to? No. *Want* to? Yes. It’s a geek thing, I just want to be in control of the absolute maximum amount of my computers as I can be – in theory at least. Indeed it does, but that’s not a “new” feature to me: my last few phones have all done that, too. Not that it isn’t a fab feature; it’s just nothing new to me. I’m looking out for a new phone and the Samsung Galaxy S II was what seemed best – any reason you chose the Sensation instead (the keyboard, perhaps)? The deciding factors that weighed the Sensation in above the Galaxy S II was that the former seems to be of a sturdier construction and that HTC Sense seems to be a lot “smarter” in its design than TouchWiz. It was a close thing, though. The major selling point for the Galaxy S II that was significantly better than the Sensation was that it’ll have NFC support, but it turns out that the UK edition won’t have the chipset for NFC until later in the year.